The impact of open source on operating systems and databases has been profound. flexiWAN introduces the world's first SD-WAN open source that will disrupt enterprise networking from vendor specific locked systems to multi-vendor, open systems, bringing back power to the community. Welcome to the Second Wave of SD-WAN. 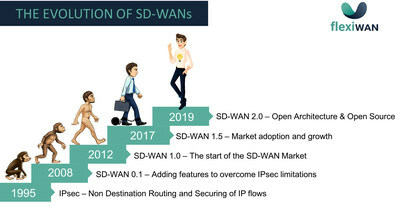 PARIS, April 9, 2019 /PRNewswire/ -- flexiWAN, the pioneer of the Second Wave of SD-WAN is coming out of stealth mode offering the first SD-WAN open architecture, open source solution. The beta software is available now to enterprises and service providers for private POCs. "flexiWAN is working with select enterprises and MSPs who have received early access to the system and joined the community supporting the flexiWAN project," says Amir Zmora, CEO and co-founder of flexiWAN. "We are now onboarding more companies to our community, giving them early access to flexiWAN, prior to the general availability planned toward the end of 2019." The closed nature of current SD-WAN is a major concern for enterprises and service providers. Existing SD-WAN closed black box solutions limit the ability of IT managers to control their networks, select the elements and technologies that comprise the SD-WAN they deploy and limit the differentiation service providers can offer to their customers. Networking technologies will continue to evolve, the move from Intent-Based Networking to Increasingly Autonomous, Self-Driving Networks being one of these changes. "The rapid and on-going changes in technologies mean enterprise networks will benefit from an open and flexible foundation. This will allow for the integration of new cutting edge technologies without being required to forklift each time new technologies are introduced," says Steve Garson of SD-WAN Experts. "By offering an open source SD-WAN architecture, flexiWAN is giving enterprises and service providers the opportunity to control not only the functionality of their SD-WAN system but also the elements that comprise it." Open source had a tremendous impact on operating systems and databases. Over the past 20 years, every area of IT has been radically transformed accept for networking. As part of networking becoming all software, it makes sense that it too join the open source community in a bigger way. Enterprises are spending about $4B a year on routing software and equipment. For decades, the strategy of major vendors has been to offer a monolithic software products that run on proprietary hardware that only scaled vertically. This has allowed them to extract high value from enterprises and service providers as they have been locked in to that solution. The shift from proprietary hardware to general purpose hardware running virtualized routing software is the first step to limiting vendor lock and providing cost effective horizontal scaling. The next step is allowing for decomposition of the software itself through the option of integrating 3rd party technology into the core of the system. This open architecture that comes in a form of open source is the Second Wave of SD-WAN. flexiWAN is pioneering this wave. "Enterprises are increasingly looking to service providers to manage and implement their SD-WAN," said Joshua Bancroft, senior research analyst, IHS Markit. "In our recent 'Edge Connectivity Strategies North American Enterprise Survey,' respondents indicated SD-WAN as a managed service will be the preferred consumption method by the end of 2019. An open source SD-WAN initiative will increase innovation and enable service providers to differentiate their managed SD-WAN offerings." flexiWAN is currently conducting private POCs. Getting access to flexiWAN and joining the community is easy. Enter your details on our website and we'll send you more information right away. flexiWAN is pioneering the Second Wave of SD-WAN through an Open Architecture SD-WAN Open Source that allow for 3rd party logic to be integrated into the core of the system. To learn more, visit flexiWAN.com and follow us on Twitter @flexiWAN and Linkedin.